Pool tile is perhaps the most striking of all tile being made today, and for good reason. Just look at the tiled waterfall to the right and notice the cobalt blue tiles complimenting the crystal clear water. Similar effects are being created everyday with the myriads of colors and designs that are presently available. Swimming pool tiles are typically made of glazed porcelain and are waterproof and frost proof making them an ideal choice for any climate. Like other mosaics, individual tiles are usually mounted on sheets of mesh for easier installation. The same is true for any trim pieces such as listellos and borders. With more elaborate swimming pool designs being considered today, there comes the challenge of coordinating just the right tile color and pattern combination. Thankfully, the industry has kept up with this growing trend. 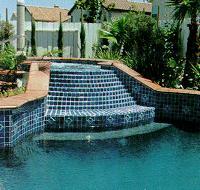 You'll find original and striking choices available that will literally make your pool a true work of art. And even though your present pool design is what you would call pretty standard (and somewhat boring), it is heartening to know that your pool can be the talk of the neighborhood, just by simply choosing an exciting and unique color and style of porcelain tile to set it off. Be bold and daring. Who knows, you may actually use the pool more yourself instead of just cleaning it. For more information on this and other natural stone flooring products... FloorBiz is your starting point to all the important swimming pool tile sites on the internet.